We're sorry, but space Lounge room for small teams is no longer available. This large meeting room is perfect for creative brainstorms and breakout sessions with smaller teams. It includes an eight-chair conference table, a couch, a comfortable atmosphere and a view of West 25th Street. The room could offer extra tables and chairs for free if your team constitutes slightly more than 8 people. 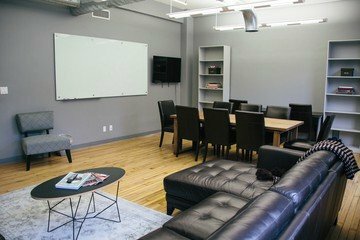 This NYC conference room is rather suitable for companies looking for a relaxed atmosphere to have a meeting with up to around 20 people, which still needs to be professional. Don’t worry about missing out on professional equipment, as the conference room in Flatiron is equipped with a 52 ’’ TV, Conference Phone Line, 8’ x 4’ Whiteboard and an HDMI and thunderbolt connection, free for you to use. These tools are believed to ensure productive and successful meetings, which are full of creativity sessions and a lot of brainstorming. Besides, you can also make use of coffee and filtered water for free and the catering options are flexible. 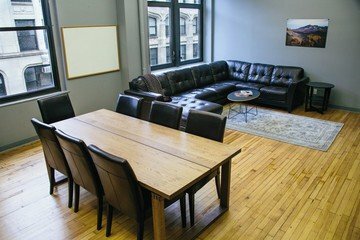 The NYC conference room costs $99 an hour and there are also packaged rates available for long time rentals. Each guest, whether they come from out of town or live in the city, will easily find this Flatiron location. It is only a short walk from the F, M, C, E, N, 1, 2, and 6 trains! Besides, it is so centrally located that it will take you less than 10 minutes to get to the well-known Madison Square Park and there are also many other facilities in the direct vicinity.